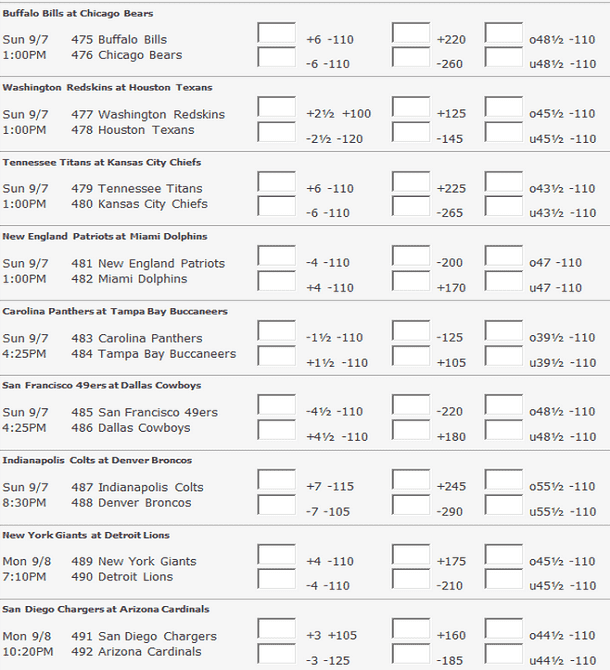 With training camps across the country just getting underway, some sportsbooks have already posted their Week One NFL point spread odds and totals. One of our favorite offshore operators, 5Dimes, has already had lines up for the first week of the season for two months now. I’m taking a look at their Week One odds before the inevitable rash of season-ending injuries throughout the preseason, which will no doubt move the lines. We’re still a little over a week from the first preseason game, but training camps around the league have started up. On a side note, isn’t one or two preseason games enough? Every year we hear from both players and coaches, especially after a starting lineman tears his ACL, that no one wants to play these games. Let’s cut down the number of preseason games to just two. We can add another game or two to the regular season schedule and avoid being bored to death or disappointed when one of our star players goes down for the year. Carolina is coming off one their best seasons in franchise history, and the best season ever for still-emerging quarterback Cam Newton. The Panthers went 12-4 and won the NFC South, beating out the rival New Orleans Saints for the division title. However, Carolina has lost several key players to free agency, including wide receivers Steve Smith and Brandon LaFell. They added veteran Jericho Cotchery, but their offense has a serious lack of depth at receiver. Also, other than some tough divisional matchups and early games against Seattle and Arizona, the Panthers last season faced a litany of .500 or below teams. They have gotten worse this offseason and will now face a tougher schedule and opponents who are more prepared for them. The Buccaneers had a poor year in 2013 but fired coach Greg Schiano and brought in former Bears head coach Lovie Smith. Smith should help Tampa Bay immensely, especially compared to Schiano, who was a terrible defensive coach. Second-year QB Mike Glennon will compete with newly signed veteran Josh McCown for the starting job, but both are strong options in my mind. They had a strong offseason and shored up their defense by bringing in defensive end Michael Johnson and cornerback Alterraun Verner. Verner will make up for the loss of cornerback Darrelle Revis to the Patriots in a big way. The home crowd will be loud and ready to for the Bucs’ home opener and Carolina will face a stiff test. The matchup bodes especially well for Tampa Bay. While their pass defense appears to have been improved in a big way this season, it was a sore spot for the team last year. Their rush defense, however, was not. Tampa excelled at stopping the run, and that shouldn’t change. Carolina gets their offense going via the ground game. Cam Newton, with his arm and legs, along with a solid stable of backs, is how the Panthers normally move the ball. The Buccaneers should be able to stop the run and force Carolina to throw with their seemingly subpar receiving core. Most importantly, it’s one that Cam Newton is unfamiliar with. The Buccaneers have a better roster than Carolina, and now they have a head coach who isn’t running them into the ground with his personnel decisions. 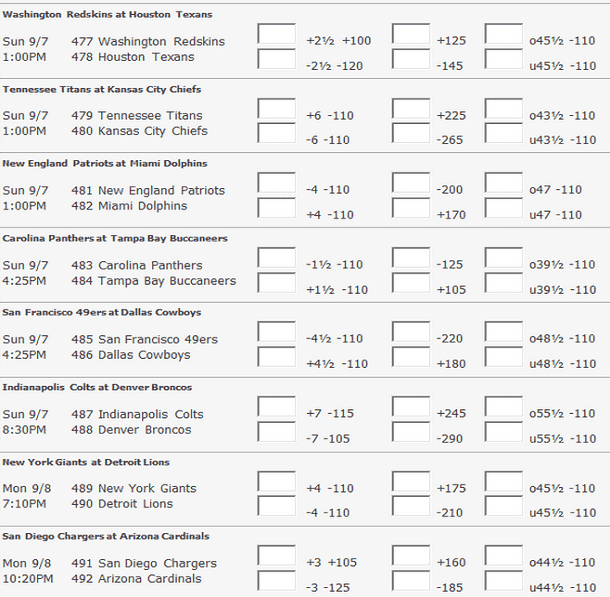 I think Tampa Bay gets the win in their opener and like the +1.5 spread. The Browns head to Pittsburgh to take on their AFC North rivals to open the season. Both of these teams had poor seasons last year, but the Steelers still had thin playoff hopes on the final week of the season at 8-8. Cleveland finished far from the playoffs at 4-12. The Browns again fired their head coach after last season, replacing Rob Chudzinski with Mike Pettine. They also hired a new general manager in Ray Farmer, but the most newsworthy aspect of their offseason (whether you agree with it or not) came via the 2014 Draft, where they drafted Johnny Manziel. Manziel hasn’t taken an NFL snap yet, nor has he been named the starter (the Browns will announce their starter after the third preseason game), but he does lead the NFL in jersey sales. The league and the American public have become enamored with “Johnny Football,” despite his skill set not necessarily translating into NFL success. Worse news for the Browns is the likely season-long suspension of wide receiver Josh Gordon, who was one of the best players in the league last season. While Cleveland’s defense should be one of the best in the league, their offense may be one of the worst. Pittsburgh, on the other hand, has upgraded on offense, bringing veteran wide out Lance Moore and running back LeGarrette Blount. They also upgraded their somewhat shaky defense from last season by signing former Carolina free safety Mike Mitchell. Pittsburgh finally found their footing after a rough start last year and improved on defense as they headed into the end of the season. The Steelers don’t need to be perfect on offense to beat the Browns because I think Big Ben and company can score at least 20 points even against this tough defense. The Browns will have a hard time scoring, whether Manziel or Bryan Hoyer is under center. Without Josh Gordon, their number one receiver is Nate Buerleson, who should be no trouble for Pittsburgh cornerback Ike Taylor. I might suggest waiting on this line, however. If Manziel gets the nod as the starter, I suspect there will be some public action coming in for the Browns, and the odds should move in Pittsburgh’s favor. In a battle of two teams heading in seemingly different directions, the 49ers head to Dallas to take on the Cowboys in Week One. San Francisco ended their season just one win away from reaching their second Super Bowl in a row, losing to the eventual champion Seattle Seahawks. Dallas finished second in the NFC East at 8-8, but did not qualify for the playoffs. Despite some questions coming into the season, with Aldon Smith facing a suspension and NaVorro Bowman likely slated to miss at least Week One, the Niners look stacked on offense. Colin Kaepernick signed a huge deal this offseason and the weapons around him, including wide receiver Michael Crabtree and tight end Vernon Davis, continue to improve ever year. Kaepernick will be eager to start the season off on strong note after his big deal, and he’s facing a defense that should allow him to do just that. The Cowboys have the worst defense in the league, by a large margin. Shockingly, it got even worse this offseason. Dallas lost DeMarcus Ware to free agency and learned that Sean Lee will be out the entire season with a torn ACL. Though the Cowboys focused heavily on defense in the Draft, it will likely be an uphill battle for them to stop opposing offenses all season long. There’s little reason to suspect they can stop Kaepernick’s dual-threat abilities, let alone hold down this offense. Tony Romo and the Dallas offense have plenty of weapons as well, but the 49ers defense is an above-average unit. This one may turn into a shootout, but I think San Francisco snaps Dallas back into the reality that they aren’t going anywhere this season with their atrocious defense. The Niners should win comfortably.